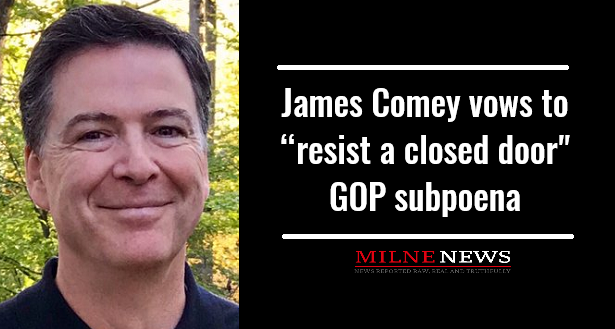 Former FBI Director James Comey announced on Twitter that he will “resist” the GOP subpoena for him to appear in a closed-door hearing, claiming they would “selectively leak” and “distort” any testimony he gives. GOP members of the House Judiciary and Oversight committees are “eager” to question James Comey on his controversial decision to not recommend a criminal indictment against Hillary Clinton for her use of a private email server while she was Secretary of State. They also wish to ask Comey about the memos he kept of his meetings and conversations with President Trump. Congressman Trey Gowdy (R-S.C.) has slammed Comey for calling for a public hearing, claiming it would enable the former FBI Director to hide behind the excuse of not being able to answer the questions in a public setting. “The last time I saw Jim Comey in a public Congressional hearing, almost 100 times he said ‘I can’t answer in this setting,’ he continued. So why in the world would he want to go back to a setting where he knows he can’t answer all the questions? I’m sure he only wants me to have five minutes. I’m sure of that,” Gowdy added.